For more information about how isolation segments work, see the Isolation Segments section of the Cloud Foundry Security topic. For more information about creating isolation segments, see the Installing PCF Isolation Segment topic. Note: The instructions in this topic assume you are using Google Cloud Platform (GCP). The procedures may differ on other IaaSes, but the concepts should be transferable. Isolation segments isolate the compute resources for one group of applications from another. However, these applications still share the same network resources. Requests for applications on all isolation segments, as well as for system components, transit the same load balancers and Cloud Foundry routers. A shared Isolation Segment is the default isolation segment assigned to every org and space. This can be overwritten by assigning an explicit default for an organization. For more information about creating isolation segments, see the Installing PCF Isolation Segment topic. The illustration below shows isolation segments sharing the same network resources. Requests for applications in an isolation segment must not share networking resources with requests for other applications. The Cloud Foundry management plane should only be accessible from a private network. As multiple IaaS load balancers cannot typically share the same pool of backends, such as Cloud Foundry routers, each load balancer requires an additional deployment of routers. Create a network or subnet for each isolation segment on your infrastructure. For example, an operator who wants one shared isolation segment and one private segment could create one network named sample-network with two subnets named sample-subnet-shared, sample-subnet-is1. For more information about networks and subnets in GCP, see the Using Networks and Firewalls topic in the GCP documentation. To configure the subnets with Bosh, use Bosh Cloud Config subnets. Each subnet in the IaaS should correspond to a Bosh subnet that is labeled with the correct isolation segment. Navigate to the Assign AZs and Networks section of the PCF Isolation Segment tile to assign your isolation segment to the network you created in Step 1. See the Installing PCF Isolation Segment topic for more information. Navigate to the Resource Config section of the PCF Isolation Segment tile and use the dropdown menu to set your Router instances to a number greater than zero. See the Installing PCF Isolation Segment topic for more information. If your IaaS supports it, navigate to the Resource Config section of the PCF Isolation Segment tile and enter the name of your load balancer under Load Balancers. See the documentation specific to your IaaS in Installing Pivotal Cloud Foundry for more information. If your IaaS does not support this configuration, you must create static IP addresses and assign them to your load balancer out of band. Create a separate domain name for each router instance group, and configure DNS to resolve these domain names to a load balancer that routes requests to the matching routers. Note: You must configure your load balancers to forward requests for a given domain to one router instance group only. 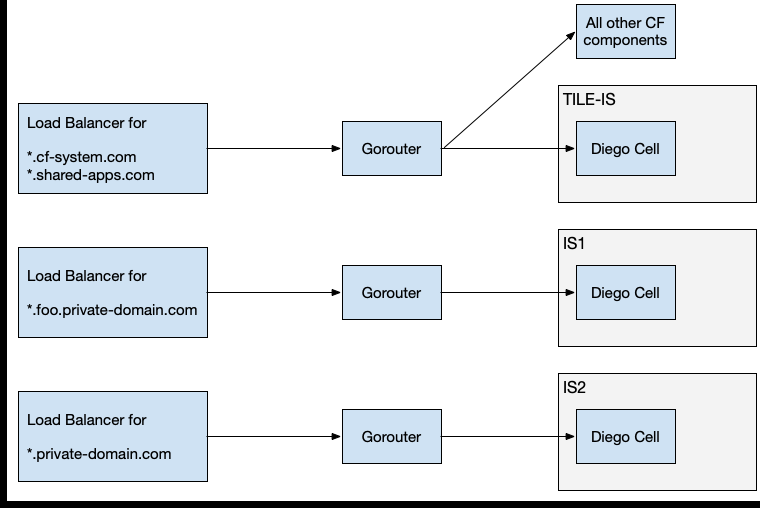 As router instance groups may be responsible for separate isolation segments, and an application may be deployed to only one isolation segment, requests should only reach a router that has access to the applications for that domain name. Load balancing requests for a domain across more than router instance group can result in request failures unless all the router instance groups have access to the isolation segments where applications for that domain are deployed. It is a common requirement for applications on separate isolation segments to be accessible at domain names that share a domain, such as private-domain.com. To achieve this configuration while also obeying the guideline for forwarding requests for a domain to only one router instance group, create a new Cloud Foundry domain for a needed subdomain, such as *.foo.private-domain.com. Requests for system domain *.cf-system.com and the shared domain *.shared-apps.com are forwarded to the routers for the shared isolation segment. Requests for private domain *.foo.private-domain.com are forwarded to the routers for IS1. Requests for private domain *.private-domain.com are forwarded to the routers for IS2. Configure firewall rules to allow for necessary ingress and egress traffic for private and shared isolation segments. Assuming a default deny-all rule, properly configuring firewall rules prevents a request with a spoofed Host header from being forwarded by a router to an application in a different isolation segment. Note: Firewall rules are specific to each IaaS, so the exact definition of Source and Destination depends on the IaaS. For example, on GCP, a Source is a subnet and a Destination is a tag. On AWS, both Source and Destination are security groups. jumpbox-to-is1 Jumpbox VM tcp:22 Private isolation segment Jumpbox VMs to reach private isolation segment through SSH or BOSH SSH. is1-to-jumpbox Private isolation segment tcp Jumpbox VM Private isolation segment to reach jumpbox VM. Opens reverse SSH or BOSH SSH tunnel from jumpbox VM to private isolation segment. diego-cell-egress Diego cell VM on private isolation segment tcp Internet If Diego Cells must download buildpacks to stage applications, allow egress traffic from all Diego Cell VMs on private isolation segments to reach the Internet. For more information about ports used by agents to communicate with BOSH, see bosh-deployment in GitHub. For more information about networks and firewall rules for GCP, see Using Subnetworks in the GCP documentation. See the following table to understand which protocols and ports map to which processes and manifest properties for the is1-to-shared rule above. 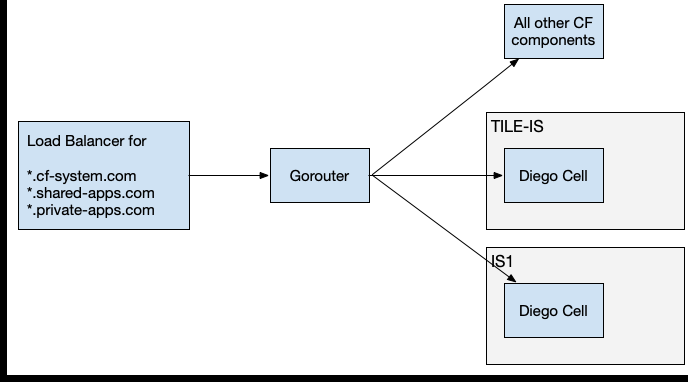 Securing apps that run in an isolation segment To provide security guarantees in addition to the firewall rules described above, you can configure sharding of the Gorouter’s routing table, resulting in a router dedicated for an isolation segment having knowledge only of routes for applications in the same isolation segment. In the Networking configuration pane of the Pivotal Application Service (PAS) tile, select the checkbox labeled Routers reject requests for Isolation Segments. Set the Router Sharding Mode in the isolation segment tile to Isolation Segment Only. 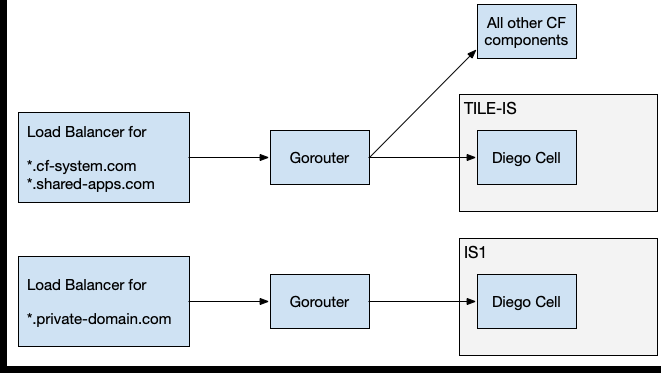 Deploying additional routers for PAS The flexibility of the configuration also supports deployment of a router that excludes all isolation segments. In the Networking configuration pane of the PAS tile, select the checkbox labeled Routers reject requests for Isolation Segments. Set the Router Sharding Mode in the isolation segment tile to No isolation Segment. Note: For compute isolation only, you can leave the Routers reject requests for isolation segments checkbox unselected in the PAS Networking pane. This is the default setting, which does not require any additional routers for the Isolation Segment tile.